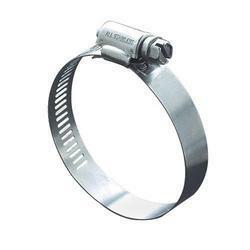 We are one of the pioneered manufacturers and suppliers of Worm Drive Hose Clamps. Our products are made of high-grade raw-material procured from the trusted vendors ensuring the quality of our products without any compromises with the quality. Vibration proof quality by worm drive principle ensures retention of the pressure on the hose and so leakages of costly / dangerous fluids is avoided. Smooth bottom surface does not wear the hose at the same time perforations on the band keeps the clamp intact at high pressures also. These clamps are offered with high clamping pressure and low tightening torque, which are used for general purpose. Clients can avail these clamps with OEM specifications and with different bandwidths and clamping diameters. Owing to their precise designing, robust construction and uniform pressure distribution, these clamps are widely demanded by the clients. Moreover, to protect the environment, we make use of minimal zinc plating.